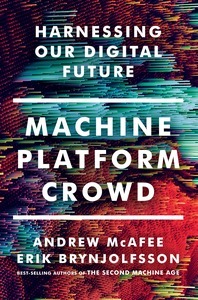 Machine, Platform, Crowd - Description | W. W. Norton & Company Ltd.
We live in strange times. A machine plays the strategy game Go better than any human; upstarts like Apple and Google destroy industry stalwarts such as Nokia; ideas from the crowd are repeatedly more innovative than those from corporate research laboratories. Andrew McAfee and Erik Brynjolfsson know what it takes to master this digital-powered shift: we must rethink the integration of minds and machines, of products and platforms, and of the core and the crowd. The balance now favours the second element of the pair, with massive implications for how we run our companies and live our lives. McAfee and Brynjolfsson deliver a penetrating analysis of a new world and a toolkit for thriving in it. For start-ups and established businesses or for anyone interested in the future, Machine, Platform, Crowd is essential reading. Minds and machines: can we work together in the digital age?